Across the snowy mountains of the world, railroads are protected from avalanches by snow sheds, sturdy roofed structures of a uniquely American origin. Today these protective structures are built from concrete and steel, but they originated from massive galleries of timber that were erected during the construction of the transcontinental railroad. In 1860, when Theodore Judah was completing his survey of a route for the transcontinental railroad, he recommended a route across the Sierra Nevada Mountains through Donner Pass and Dutch Flats for the best passage. Judah was aware of the severity of winters at the mountain summit having personally experienced some of its weather extremes. He was also familiar with the history of the infamous Donner Party who had spent the winter of 1846-47 stranded on the eastern side of the summit. Judah had faith in his dream and he had faith in technology, asserting that state-of-the-art snowplows piloted by powerful locomotives would manage the snow. Unfortunately, in his enthusiasm, he underestimated the formidable winter weather. 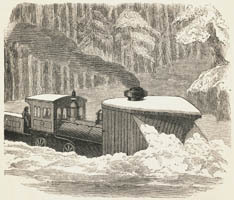 A locomotive with a plow attachment was used to remove snow from the tracks. A figure of a man is shown seated behind the cab provides an indication of the scale. 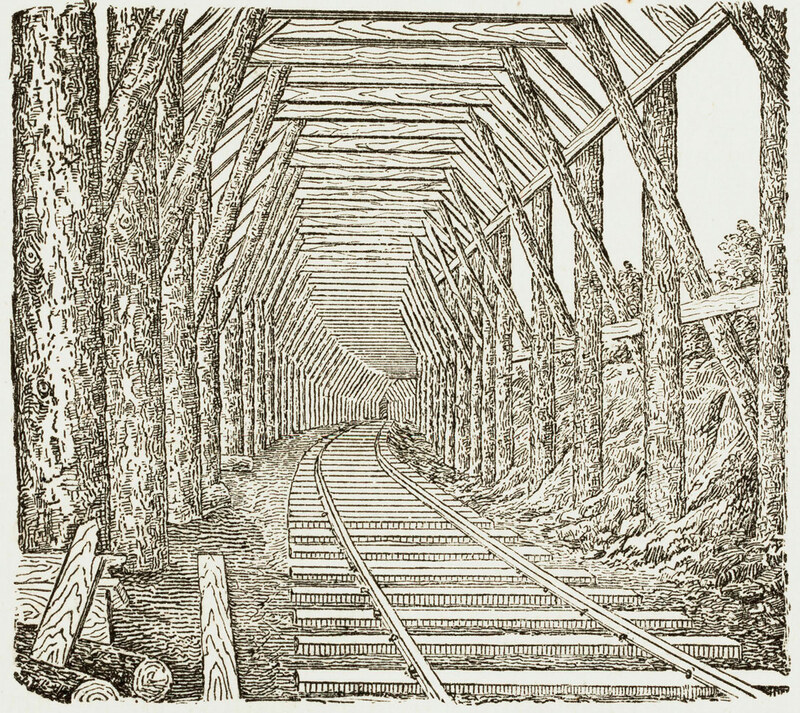 By 1865, the Central Pacific Railroad was concentrating its workforce on building a series of tunnels to cross the summit of the Sierra Nevada Mountains. 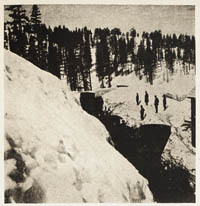 Between the tunnels, mountain slopes provided ample surface for tracks, but the extreme weather at the highest elevations impeded progress. Snow-heavy areas were worked in the summer months and, as winter approached, the construction leap-frogged east to lower elevations with milder temperatures. This pattern provided a short-term solution. Workers were digging out snow impacted tracks as late as July, which left only a few months for construction and made winter rail travel on completed tracks impossible. Onlookers observed as a plow attempted to clear massive snow drifts. By the autumn of 1866, the Central Pacific was preparing for the onslaught of snow. The Sacramento, the Central Pacific's original locomotive but by then retired, was returned to service to deliver a gigantic snowplow with enough size and power, railroad administrators believed, to conquer the deepest blizzard. The plow was a heavy load for the locomotive. Scouts rode ahead to warn teamsters of their advance because the noise so terrified horses and oxen, that they would run wild. The journey took six weeks, from early November to mid December and the winter snows were beginning in earnest by time the Sacramento reached its destination and the plow put to work. The plow was mounted on a standard railcar, but the car was hidden by the body of the structure since it was intended to operate close to the track. It measured 10 feet wide, 11 feet tall, and 30 feet long. The front was a huge wooden wedge, reinforced along the edge by iron plates that sloped down to the rails. The lower portion of the wedge would scoop up snowdrifts and on the upper portion, a jutting prow would part the drifts, throwing the snow as far as 60 feet. But on December 28, 1866, a town on the west side of the mountains, Cisco, California, experienced its largest snowfall in 10 years and even the giant snowplow was no match for it. The winter of 1866-67 was the worst on record. There were 44 snowstorms, ranging in severity. The smallest was a squall with only ¼ inch of snow accumulation, but the largest lasted two-weeks and dropped at least six feet of snow. The total snowfall that winter accumulated to 40 feet. Tunnels were cut through the snow so that the men could continue the arduous job of boring the granite tunnels at the summit. Snow slides cost both lives and labor with scores of men lost that winter. When the timber trestle at Cisco was destroyed during an avalanche, management at the Central Pacific understood that something must be done, not just to continue building the railroad, but in order for trains to travel during the long winters on the operational tracks. Over a lunch meeting in Sacramento, Charles Crocker and Leland Stanford discussed the situation, knowing they were facing serious consequences. Lost time from a construction hiatus during the long winter, lost revenue from track closures, and lost credibility for the entire project were weighed against the tremendous expenses to be incurred with the construction of snow barriers. 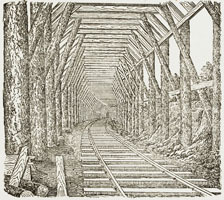 Experienced in the design of bridges, tunnels, and trestles, Acting Chief Engineer Lewis M. Clement, proposed the implementation. Arthur Brown, who was in charge of the on-site construction, had the experience deemed necessary to plan and supervise the building process. Brown and his crews needed to cover a total of 37 miles in a 40-mile stretch, a project that lasted three years. With only five months of hospitable weather and no time to waste, the first five miles of experimental sheds were erected in the summer of 1867. The winter of 1867-68 showed that the structures were not sturdy enough to withstand the weight of avalanching snow. With modifications in place, the construction of permanent snow sheds began in earnest the following summer. Two types of barriers were constructed. 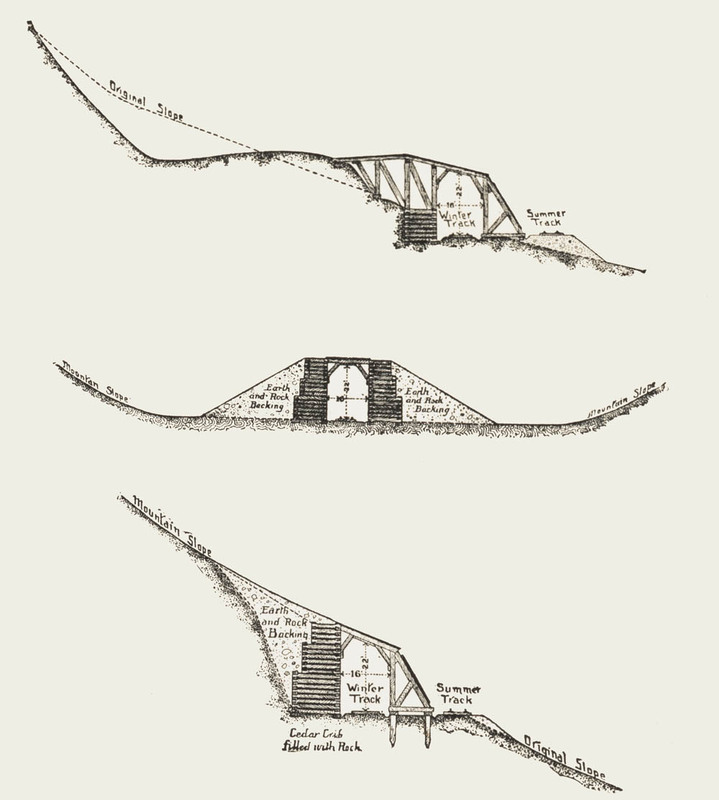 One type, the snow sheds, consisted of wooden galleries with roofs that followed the slope of the mountain. 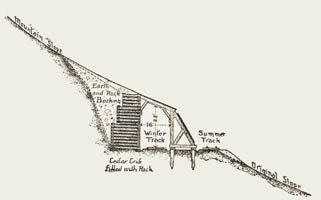 With the shed roof in place to extend the slope of the mountains, avalanches would pass over the tracks without dumping their heavy load. The second type consisted of large walls made of masonry. Built across ravines, these barriers prevented the snow sheds from taking a direct hit from slides. Eighteen miles of rails were covered that summer using massive amounts of timber for the beams and crossbeams. Interior of a snow shed during construction. The final 14 miles of snow sheds were built by the winter of 1869. Six trains were used to haul materials. At first the timbers were milled in Truckee, California, but they could not keep up with demand, so much of the lumber was hand-hewn from the nearby forests. By the time the sheds were completed, they had used 65,000,000 feet of 12" by 14" timbers and 900 tons of iron for bolts and spikes. An estimated 2,500 laborers worked on the project. The standard for labor was $2.50 to $3.00 a day, but to entice workers to the project, they were offered $4 a day, about what a man could expect to earn in the mines. The total cost of 37 miles of tunnel was unprecedented, estimated at over $2,000,000. Despite the expense, E. B. Crocker (brother to Charles Crocker) wrote to Collis P. Huntington, "Those snow sheds will pay for their cost in a single winter." Before the construction of snow sheds, ice impacted tracks were cleared either by plow or more often by shovel wielding laborers. One seven mile stretch of the ravine beyond Reno had a 30 foot snow accumulation which was cleared by Chinese work crews. The implementation of snow sheds was a success. The winter of 1869, trains were blocked for a mere four days. Since then snow sheds have been protecting mountain rails around the world, first in the Canadian Rockies and later in Japan and the Alpine regions of Europe.